In this add on for Mutant Football League, werewolves with a lust for blood jump into the action and eviscerate the competition! • Rampaging Werewolf Species – Unleash the hounds! Werewolves have awesome hurdling abilities and make for great linebashers, safeties and running backs. • Karcass City Creeps Team & Arena – One of the league’s oldest franchises with an explosive offense led by their young quarterback, Hatrick McGnomes. Includes “Arrow in your head” home stadium. 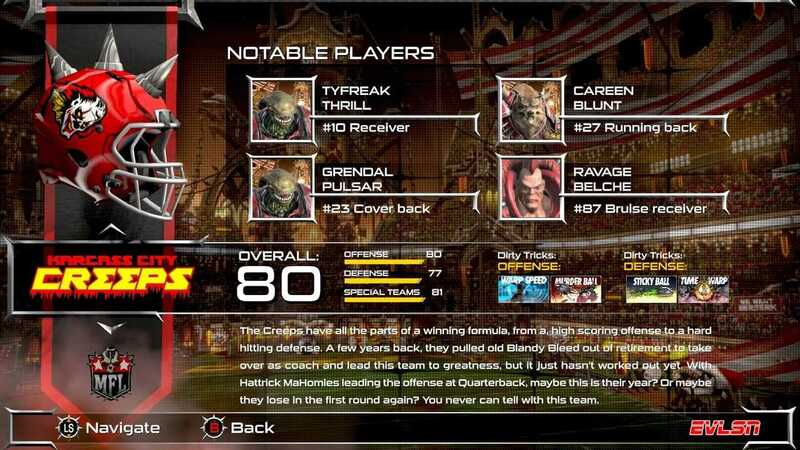 • New Gorleans Zombies Team & Arena – Quarterback Drew Sleaze leads a Zombie offense with the league’s most punishing running attack. Includes “Terror Dome” home stadium. Copyright © 2014 - 2019 SocksCap64, All Rights Reserved. Logos, Trademarks, Pictures Belongs To Their Respected Owners. Powered By WordPress. 97 Queries in 0.550 seconds.